"I serve on the Board of an important community non-profit organization. The organization was in an unstable economic position and couldn’t see a way to stability. We engaged Allen to review programs, operations, and funding sources to help determine the options to move the organization to financial stability. Over a short period, Allen was able to understand the workings of the organization, gain the trust of the staff and Board, and come up with a path to future stability. The organization is now moving towards sound footing. " Executive Vice President, OhioHealth Corp.
"You did an excellent job with keeping us on task. I appreciate your style of facilitating which allowed for full participation from our board with lots of humor!" 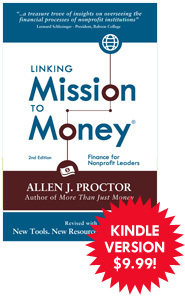 "Allen Proctor conducted an exercise with our board to help them link Mission with Money. In the course of a little more than an hour, he was able to move our board to share some common vocabulary as well as a foundation upon which deeper study could occur." "Allen organized and facilitated one of the most thought-provoking retreats I have attended. Then, working with our staff over several months he inspired them to work together to reach bold recommendations to enhance our organization. He played an essential role in helping us develop a plan for long term sustainability. Strongly recommended!" "...the best [retreat] I have attended." "You know how much I hate strategic planning sessions... but I thought today was great. I am often skeptical about consultants, but I must say [we] really came up with a good thing getting funding ... for this outstanding work. " "Wow, you were a big hit with my board. Never in 15 years have I gotten such good response for this bi annual retreat!" "...One of the most introspective and focused discussions of the future we have ever had at a strategic meeting." "I was enthralled by Allen Proctor's presentation and as I listened, I wished more funders were in attendance to hear him. Mr. Proctor validated so many factors that we, as non-profit professionals, have known for years about reliably sustaining our organizations to maintain our missions." "In 12 years of directing a non profit organization...I have never heard someone talk to funders from a on-the-ground perspective like Mr. Proctor did. He clearly articulated the realities local non-profit leaders are experiencing in this challenged economy. Excellent material with a courageous presentation." "It was a great presentation. 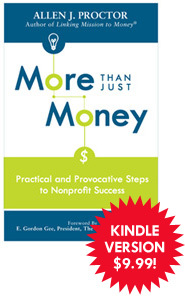 I enjoyed listening to his candid review of how things really function in the nonprofit world. He was realistic and the information was valuable." "Allen's presentation had a powerful impact on members of my Board of Directors who were in attendance. I think they understood for the first time the needs and limitations of a small agency and what we are really capable of accomplishing." "Allen Proctor excels in translating money matters for an audience of seasoned and relatively new finance professionals. Dr. Proctor's vast experience captures the audiences' imagination, his presentation style wins their attentions, and the take-away from the session is impactful. Our audience loved him!" "I found the presentation to be very helpful. I am most interested in the topic of sustainability and highlighting the importance of maintaining surpluses of a not-for-profit in the good years. Allen's speaking style pulls the audience in, but what he is saying keeps us engaged." "This was a great presentation about the current dilemma facing non-profits and how we got there. Mr. Proctor offered new ideas about how to approach funders and advocate for the value we bring to our communities." "Mr. Proctor shared information that is very practical to what is happening today in not-for-profit organizations. To an organization's financial officer, the information was right on target and informative." "I found Mr. Proctor's presentation to be very informative and quite enlightening. He kept the audience's interest level high and interacted well with his listening audience. I learned a great deal from the presentation and look forward to reading his book." "Mr. Proctor's presentation was thought provoking and stimulated the audience to shift their paradigm of the role and function of non-profits in today's world." "Allen's major strength is structure and focus in his pre-retreat and retreat planning sessions. He is inclusive of all participants' voices while maintaining a focus on the needed outcomes of the retreat. This retreat enabled our organization to maintain a clear focus on our mission." "Allen's retreat preparation and facilitation were very effective in getting our organization to set our priorities and to ensure a strategic planning process that serves our mission. The retreat put us on the right track for a successful planning effort." "Both our board and staff are now fully engaged in Allen's mission/money matrix. The model really created a breakthrough for us!" "Perfect fit into this training program for mid-career managers at distinguished New York City arts organizations…Just the right practical attention to budgets as a tool in identifying priorities and serving mission." "Allen's books, Linking Mission to Money and More Than Just Money, are a must for any head of school or corporate CFO."